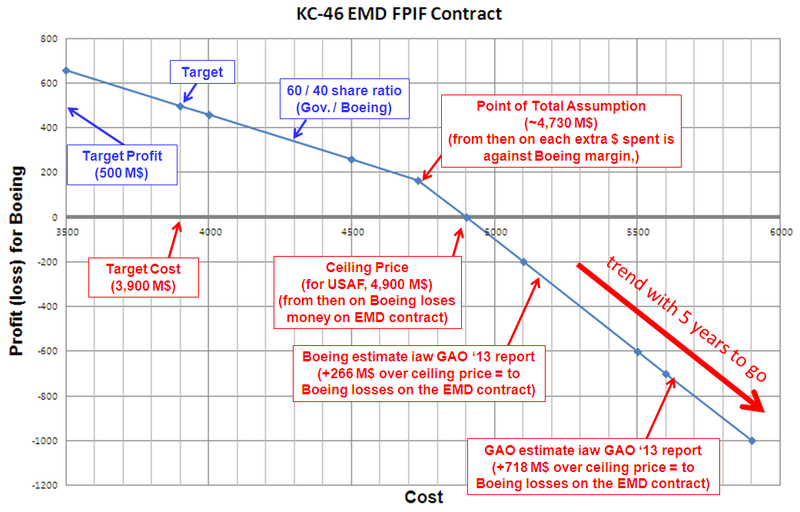 About two years ago I wrote a post, KC-46 EMD contract 101, in which I reviewed the nature, implications and status of the Fixed Price plus Incentive Firm (FPIF) that the US Air Force had signed with Boeing for the tanker K-46 Engineering Manufacturing and Development (EMD) contract. I have been wanting to write an update of that post with how the situation has evolved for some months. The recent article in Bloomberg, “Boeing KC-46 Tanker Suppliers Behind on Deliveries, GAO Finds“, has finally triggered this review. […] the Air Force projected in a revised estimate this year that Boeing will have to absorb $1.5 billion for exceeding a $4.8 billion ceiling to develop the first four planes. […] Boeing is encountering more than twice the number of software problems than originally estimated that prevent or adversely affect the accomplishment of an essential operational or test capability. Bloomberg quotes a 1.5bn$ estimated over cost based on Air Force data. KC-46 EMD Contract & Estimates (March 2012). 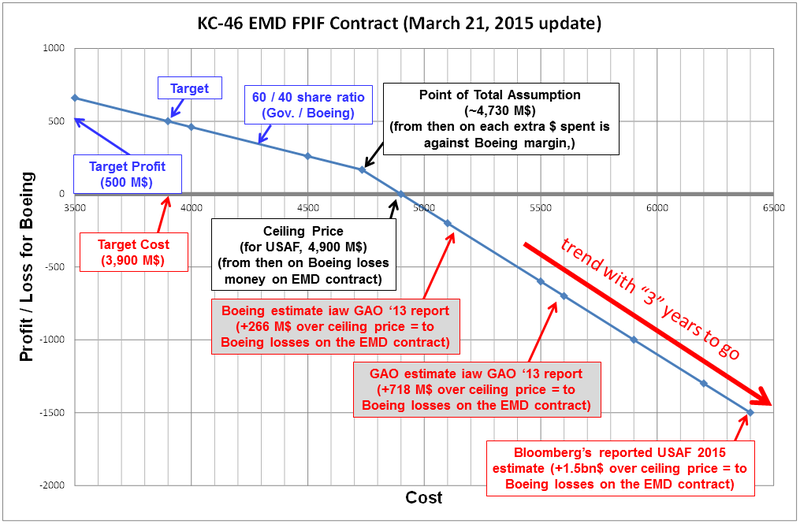 KC-46 EMD Contract & Estimates (February 2013). Why did the GAO not include such estimate in 2014 report? Wasn’t the information available? The release of such estimates in 2012 and 2013 did not sit well in some spheres? Today is March 21st 2015. I guess we shall see soon the annual report from the GAO with the specific view on the KC-46 program. I wonder whether such cost estimate will be included this time (hopefully yes). 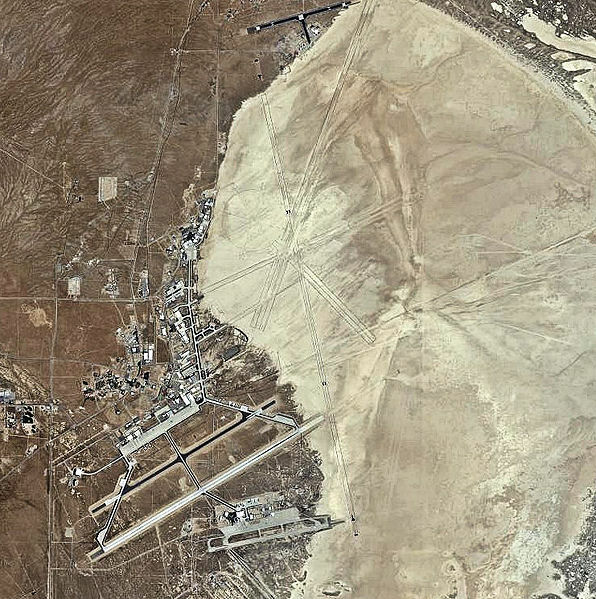 In any case, I guess the information from the Air Force estimate has been duly leaked. KC-46 EMD FPIF Contract (March 2013). 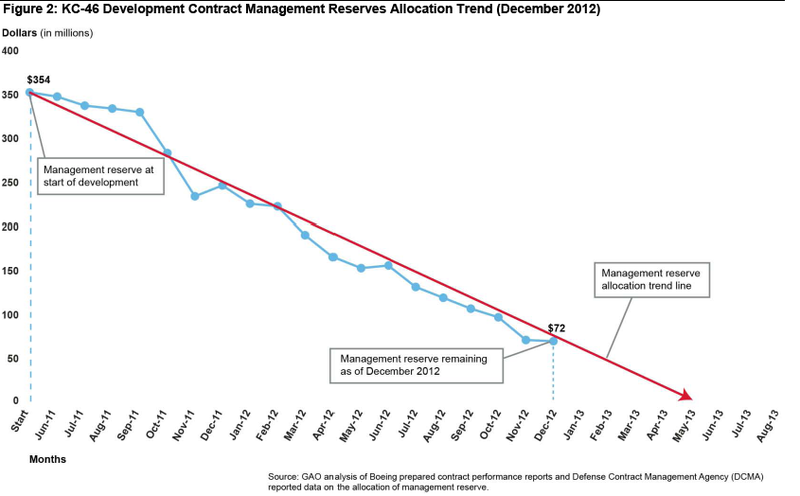 As I mentioned in the blog post from 2 years ago: this is the typical FPIF contract curve, which is the only thing which is missing in ALL the news, budgeting materials, GAO reports, etc., that I have read and is the most illustrative graphic to understand what is going to happen if the cost overruns keep piling and who is going to bear which amount of the cost from which point. 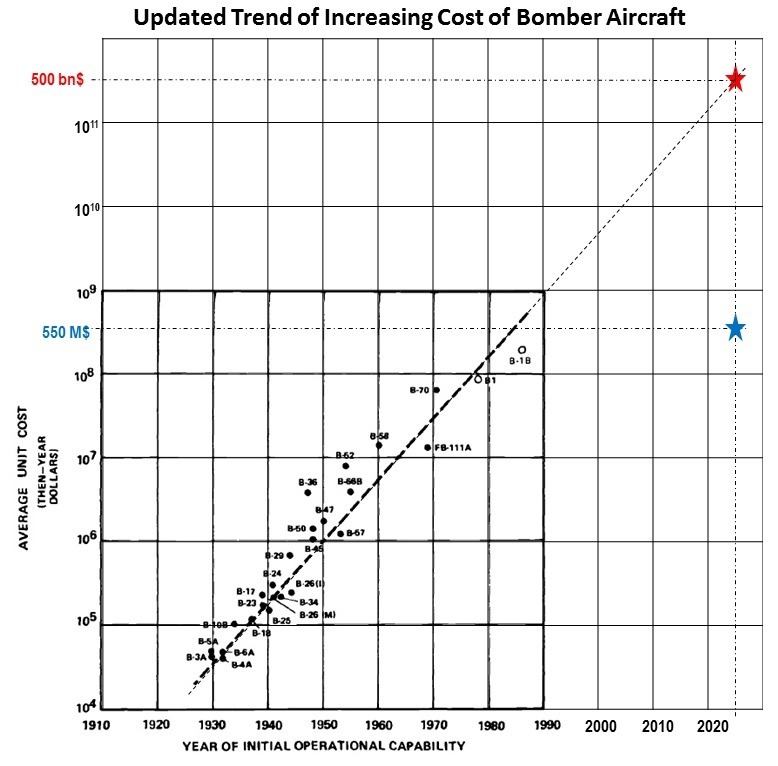 See “Total Cost” and “Remark” (source: Exhibit R-3, RDT&E Project Cost Analysis: PB 2016 Air Force). The contract ceiling price of $4.9B is the government’s maximum financial liability on the prime contract. The “Total Cost” value represents the Milestone B Service Cost Position (SCP), which accounts for the ceiling price of the contract plus the financial risk of potential design changes for the KC-46 Aircraft. I would not discard that through the justification of “design changes” the American tax payer will have to bear part of those estimated 1.5bn$ over the ceiling price. We will see. 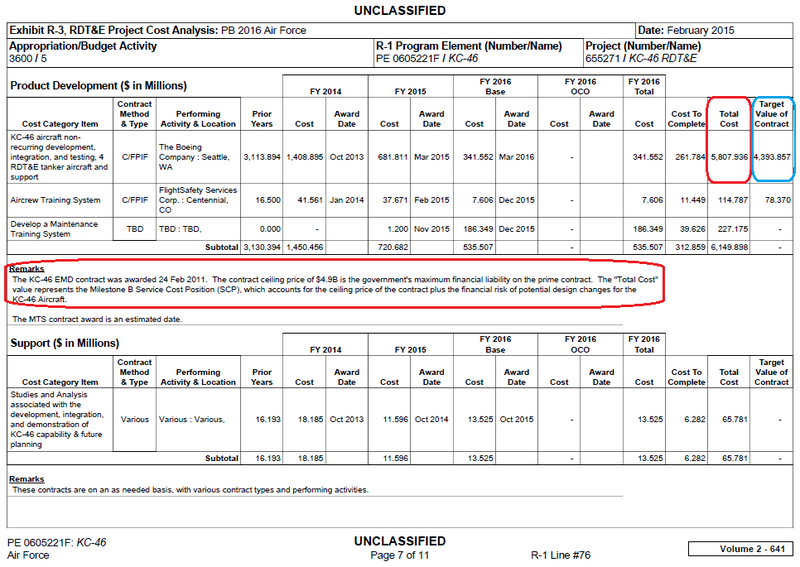 Finally, I think it interesing to see the planning included in the budget request from USAF (below), as it indicates a Tanker First Flight in the 3rd quarter of 2015 (not April 2015 as quoted by Bloomberg (“initial flight of the first fully equipped development aircraft”)). 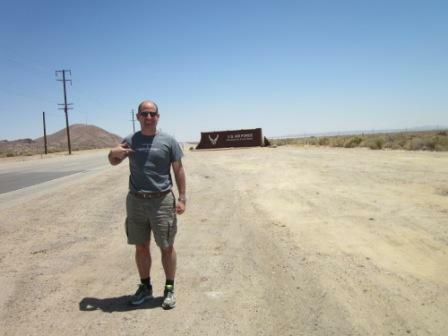 USAF FY2016 budget request – KC-46 Planning. 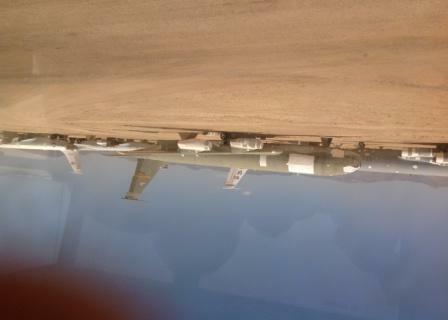 USAF FY2013 budget request – KC-46 Planning. The GAO talks about a “first flight of an aircraft that integrates military sub-systems has slipped at least three months to April 2015”, but in my view that doesn’t mean a “first fully equipped development aircraft”. 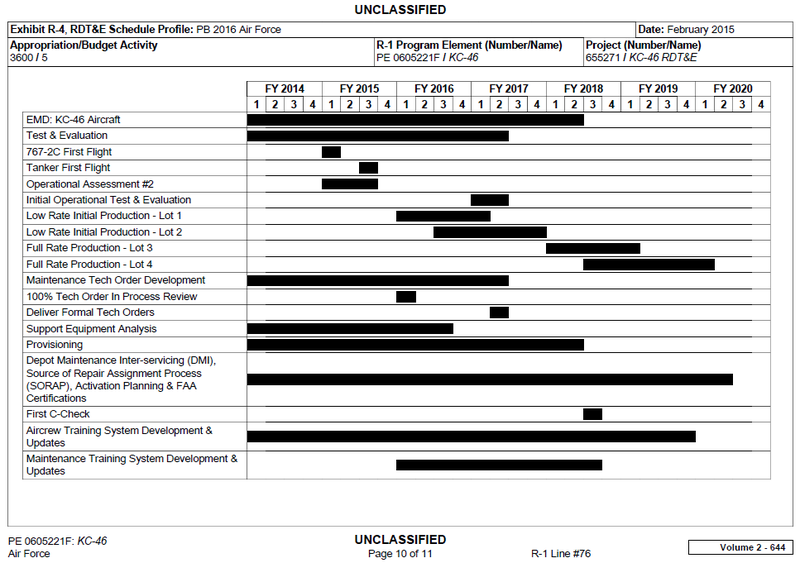 In 2012 the planning had a tanker first flight at the beginning of Q2 2015 which in the 2015 plan it is shown in Q3 2015, thus the 3-month delay mentioned by the GAO. I am indeed looking forward to the KC-46-specific report from the GAO that may be about to be published (1). (1) I may then have to write another post with a new update. 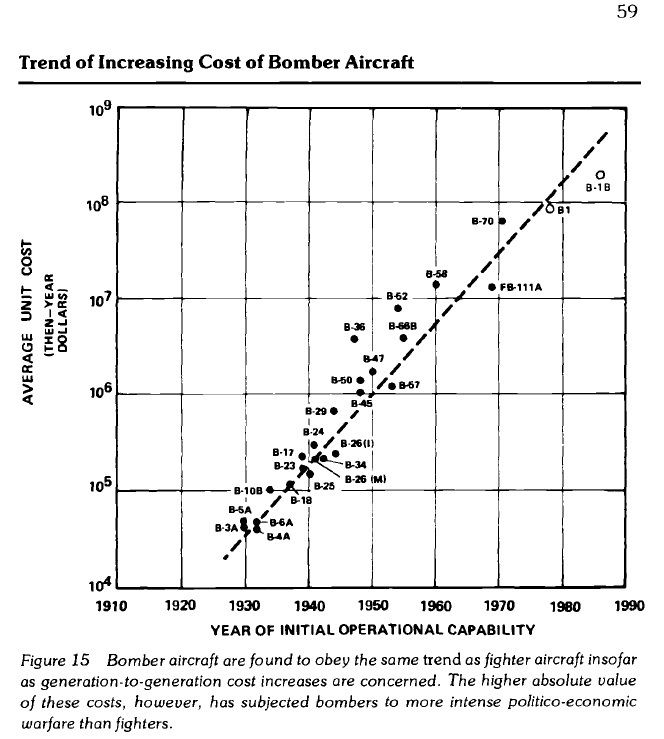 In these days in which the sequester is being often in the media, this will be a very brief post to bring to the memory a study prepared by Mitchell Institute for Airpower Studies, founded by the Air Force Association, “ARSENAL OF AIRPOWER: USAF Aircraft Inventory 1950-2009” [PDF, 6.5 MB], published in November 2010. 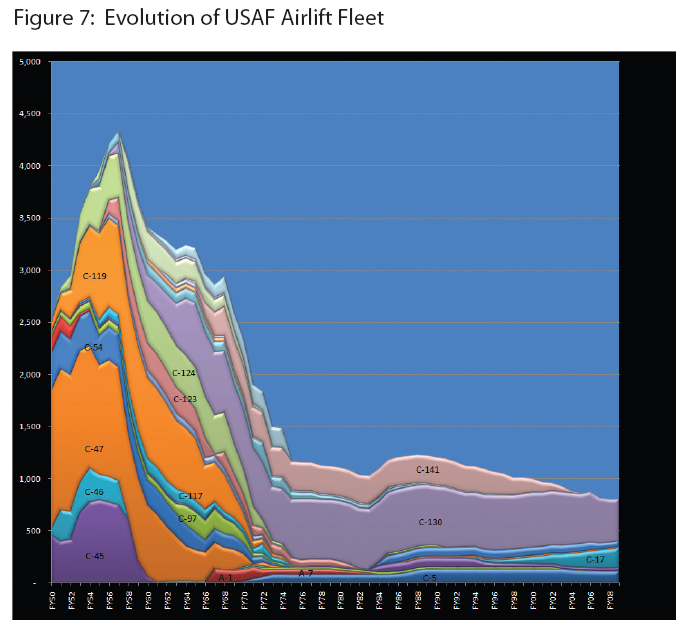 US Air Force fleet evolution 1950-2009. 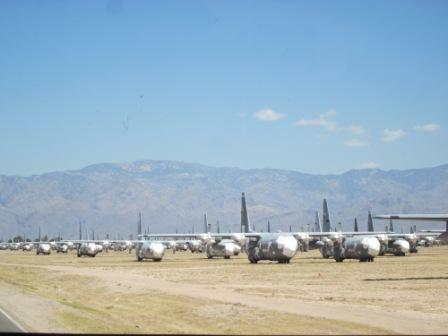 US Air Force Airlift fleet, 1950-2009. The keyword here is capability, not numbers. I will come back to here in following posts. “The KC-46 program 2012 estimates for cost, schedule, and performance are virtually the same as last year’s, with the contractor running very close to the planned budget and schedule”. 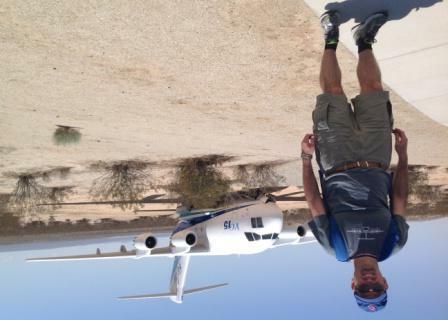 On the technical side it points to several challenges: flight test plan, completion of engineering drawings, relocation of personnel and facilities related to defense equipment, etc. However, in this post I wanted to focus only on the costs and contractual sides of the program, given the amount of articles that we could read about it during the past year. 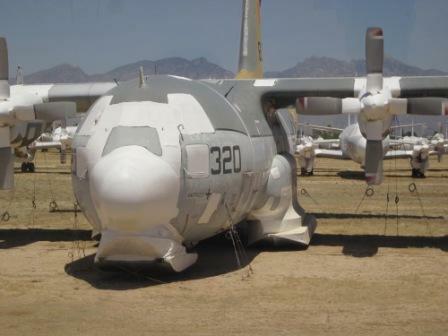 Several news have reported about the cost overruns in the program and about how these were to be born by Boeing. The last time I read about the topic, the reported overrun was of about 1.2bn$ on a 4.4bn$ contract, out of which ~500M$ would be born by USAF and the remaining 700 M$ by Boeing (see articles from Bloomberg, Aviation Week, The Seattle Times…). But, where do these figures come from? 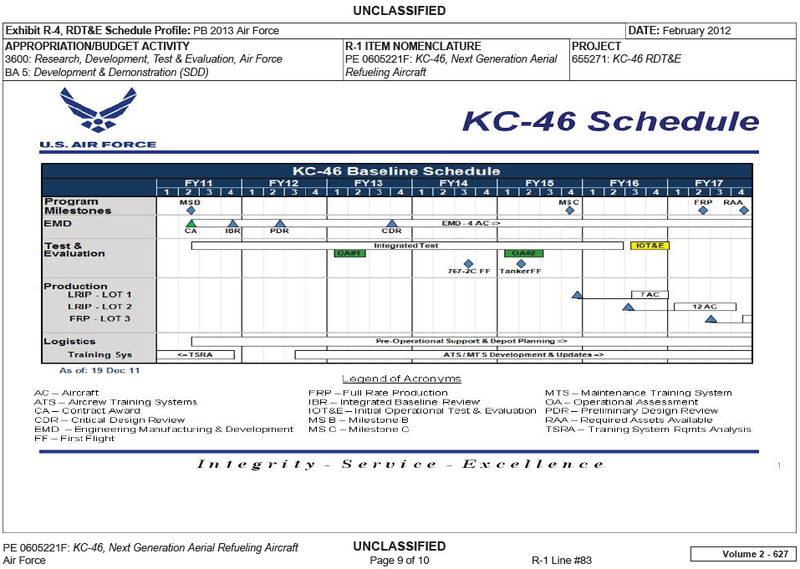 FY2013 budgeting information from the US Air Force KC-46 program here [PDF, 29 MB, from page 671]. GAO’s assessments on selected weapon programs [PDF, 14 MB]. Department of Defense (DoD) Program Acquisition Costs by Weapon System [PDF, 8 MB]. “The KC-46 program released a final Request for Proposal (RFP) on 24 Feb 2010, and entered source selection on 9 Jul 2010. The KC-46 program held a Milestone B Defense Acquisition Board (DAB) on 23 Feb 2011, received approval to enter EMD from OSD AT&L on 24 Feb 2011, and awarded the KC-46 contract to Boeing on 24 Feb 2011 to develop and procure 179 KC-46 aircraft. The KC-46 contract procurement was conducted via a full and open competition per Federal Acquisition Regulation (FAR) Part 15, and resulted in a FY 2011 EMD Fixed Price Incentive Firm (FPIF) contract. The EMD phase will develop, build, and test four KC-46 aircraft, and will qualify receiver aircraft. Thus, so far only the Engineering Manufacturing and Development (EMD) contract phase has been contracted, on February 24th Feb 2011 (you can see Boeing and DoD press releases). KC-46 EMD Contract & Estimates (Source: GAO). This graphic shows well the rate at which Boeing has been supposedly burning its margins. However, it does not reflect at all the nature of the issue, related to the type of contract this “Engineering Manufacturing and Development” (EMD) contract: a Fixed Price plus Incentive Firm type of contract (FPIF). It is not easy to find good literature online about these types of contracts. The Wikipedia for instance does not have yet an article on FPIF contracts, but only on the calculation of the Point of Total Assumption. However, you can find a couple of good sites with explanations and examples of FPIF contracts here and here [PDF from the US Army]. Target Cost (TC): The initially negotiated figure for estimated contract costs and the point at which profit pivots. Target Price: Target cost-plus the target profit. Ceiling Price (CP): Stated as a percent of the target cost, this is the maximum price the government expects to pay. 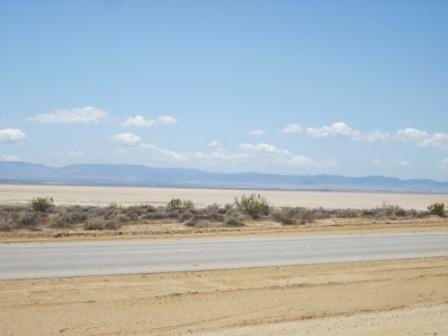 Once this amount is reached, the contractor pays all remaining costs for the original work. Share Ratio (SR): The government/contractor sharing ratio for cost savings or cost overruns that will increase or decrease the actual profit. The government percentage is listed first and the terms used are “government share” and “contractor share.” For example, on an 80/20 share ratio, the government’s share is 80 percent and the contractor’s share is 20 percent. Where can we get these figures for the KC-46 EMD contract? Some of them are referred to in the different reports and budgeting materials (explicitly or implicitly) and others can be found in the following letter from US Senator John McCain to the DoD from July, 15 2011 [PDF, 400 KB]. Share Ratio: 60% / 40% (Government / Boeing). Point of Total Assumption (calculated): ~4.73 bn$.